IDEA! 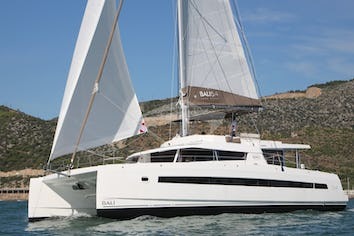 is a luxurius sailing catamaran rightfully considered equivalent to a 75-foot monohull in every aspect, from sail plan to living space belowdecks. 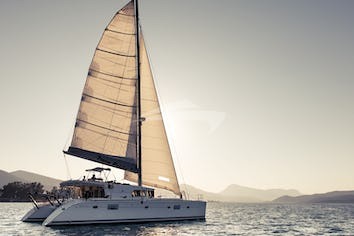 The vastness of space on board is ideal for families, young couples and groups of friends who get to enjoy hospitality rendered by a crew dedicated to the highest standards of service. Assorted Chesses and cold cuts dish served with special handmade dips from all over the world!! Kleftiko (mix of small cut pieces of meat with spices and red wine slowly cooked in a casserole for 3hrs! It was a pleasure to spent time with you, we had a greattime and excellent hospitality! For me it was one of my best journeys and Iwill never forget it. Thank you both for everything, and see you again on the nexttrip! Thanks for a great time together. You and Alex is acombination of love and kindness. All of us will remember this trip for a longtime, with a lot of memories! Thank you for allowing me and my family have such wonderfulmemories. Your kindness and friendship will be with us the best of ourlives. I will for sure never forget thetrip. I hope we see each other again! Always remember that you have friends inMiami and Harvard! You are awesome Konstantina, you have awesome cookingskills! Thank you so much! Had a wonderful trip! You guys areawesome! Thanks so much for such a great time! We loved Greece andloved seeing it through idea! Thank you for teaching me how to wind surf! I had so muchfun! Thank you for such a wonderful and amazing trip! Greece isone of my favorite places ever! Thank you for being so kind and hospitable! I had an amazingtime and the food was great! My best holiday ever! Thanks so much we had an amazing time!Yammas! Thank you for such an amazing week! You made our first tripto the Greek islands a very special experience. Amazing food, for visits to the islands and great swimmingand snorkeling! It has been our 5th cruise and probably the lastever yet. You both are a great crew. Understanding all our needs, things andplaces that we like, and sharing our laughs. Thanks to you we discover very special places, fantasticcoves and beaches, and Konstantina has delighted us with her excellent cuisine. Sailing has been great, Alex is a remarkable and very experiencedskipper. In shot, we loved it! And certainly look forward to another cruise in idea! withyou too. Just one objection! Please buy a lot of lighters for thenext trip! A beautiful journey with a wonderful crew in the Greekislands. Thanks to both for your attention, to make our trip a wonderful one.An a super boat. We hope to sail with you next summer and discover new islands,new coves with shallow waters and spend again lovely moments with you! Thank you both for such an incredible time here sailing theGreek islands. Our family had such a funtime exploring the caves, jumping of the rocks and snorkeling near remotebeaches. Alex-‘’si capitan’’-you did an amazing job of finding thebeautiful islands and the best places to swim. You have been a great captain,also an understanding person that caterers to everyone’s needs. Thank you! Konstantina what can we say? But, thank you for the mostdelicious meals and looking after us. We have enjoyed our time here and youhave made it very special for all of us. A million thanks! The delicious meals Konstantina cooked for us(and the chipsbefore lunch). Muchos besos, nos ha encantado conocer vuestras islas ydisfrutar de vuestra compania. What a wonderful week we had with you both! Alex you kept ussafe and entertained on windy days back to Mykonos and white water skiing inSchinousa. We really appreciated how you always wanted to make sure each daywas exactly what we wanted to do. Your constant answer ‘’It’s no problem’’insured that we had a great vacation! Your perch up top is the BEST place to beon a windy trip! We also feel like we learned so much about travel in theislands since you are so experienced. Konstantina the food you prepared for useach day was spectacular! Best Goat, Best Octopus, Best Meatballs, Best GreekOmelet! Every day, every meal was unbelievable delicious and beautiful! Fromthe simplest to the most complex everything you prepared has amazing flavor andbalance. You are truly talented! And your cheerful disposition and great senseof humor added wonderfully to our trip!We will miss you both and hope we cansail together again next year but this time Paros to Paros! Thank you for a wonderful week and also thank you for thetasty food! It was a pleasure meeting you! This was our first experience on a boat trip and looks like we willsurely do it again someday! Thank you, Thank you for a fantastic week in the Greekislands! John and I could not think of a better way to start off our new livesas fiancées! From the sailing talks with Alex and getting cooking ideas fromKonstantina, we think of you now as friends! Can’t wait to do it again in theBVI’s it’s not the end we will see you both soon! Thank you so much for making this amazing trip so special!It was so much fun and I will never forget it. The food was so good, theislands we visited were incredible and everyday was a new adventure. What a special trip, only made possible because both of youare amazing. We ‘ve seen part of the islands we would never have seen on ourown. You have prepared meals that we have loved & want to take home withus. Most of all we all felt very relaxed and at home on idea! A special thankyou for you both for entertaining the kids especially Jasper! Thank you sooooo much for making our holiday so AMAZING! Iloved having gourmet meals every time we eat! I enjoyed going to beautiful baysand pretty ports where we could get off and walk into the town! I can’t wait tocome back! 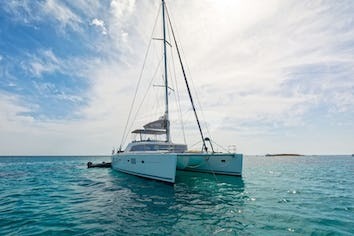 What an amazing experience & pure delight it was to sailthe Cyclades with you! You have both made our trip so special with your warmth& humor and yummy food! We wish we could stay another week!!! Speedy skipper Alex smiled and charmed us through choppy and quiet waters (perhaps controlled by Zeus and his Gods whose huge, long deep breaths blew in gusts of range –screeching and screaming when at rest). The Dustan Family felt totally secure with Alex’s very experiences skills of a young sea dog. In addition, Konstantina smiled 99.95% of the time and did ALL that was asked of her and more with very useful on shore advice. We loved the Greek food –a wonderful introduction to Greece and the Cyclades. A very balanced trip, tasting the culture and offerings of many islands –everlasting memories of diversity (the steep narrow streets and steps, sheltered by freshly painted white walls, blue painted wood and decorative red geraniums and vines. A HUGE THANK YOU to the crew/team of Idea! BRAVO! Impressed with the team spirit and comradeship of Alex and countless friends everywhere helped us squeeze into unexpected places. Total Distance: 430 Nautical Miles –perhaps OTT!!! Top Speed: 12.3 Knots. We cannot thank you enough for this amazing trip. We felt very safe and protected by Alex’s leadership. Maria, you spoiled us rotten, you kept everything shipshape and every meal delicious. Thank to both of you for James special night. Our favorite memory is when we inhaled helium and laugh totally at our voices. Finally, a huge thanks for making our Greek adventure the best it could possibly be!. Thank you for making out trip so much more wonderful that we could have imagined. Even though we were quite substantial, Maria managed to had us with her gourmet style!! The Great food and service was absolutely “ Amazing …we are moving to Greece”! You are both great hosts and Nico loves you, which for us is the most important part!! What an outstanding trip you have given us-you two are an amazing team-nothing is too much and you cater to all our needs with such case making us all so comfortable. Cook meals have been “Michelin” quality – always interesting and made with the same case as you do everything. We have been here before and we’ll be here again!! We are the newcomers and Jill has told us how amazing the crew is. Well you have exceeded our expectations – you are both talented, kind, attentive and competent. Thank you for one of the best experiences of my life! This charter has been absolutely amazing! You are wonderful people and I thank you for making my time in Greece so memorable. Efgaristo to a great skipper and the best hostess… I cannot tell you how amazing you both are… professional, courteous, charming and just phenomenal people! We don’t have words to describe this week. Everything was just perfect. We don’t know how to say which was the best part: the yacht, the skipper, Stella or the company! Everything was amazing! Alex and Stella were the best. We hope to live that dream again. It was unforgettable.